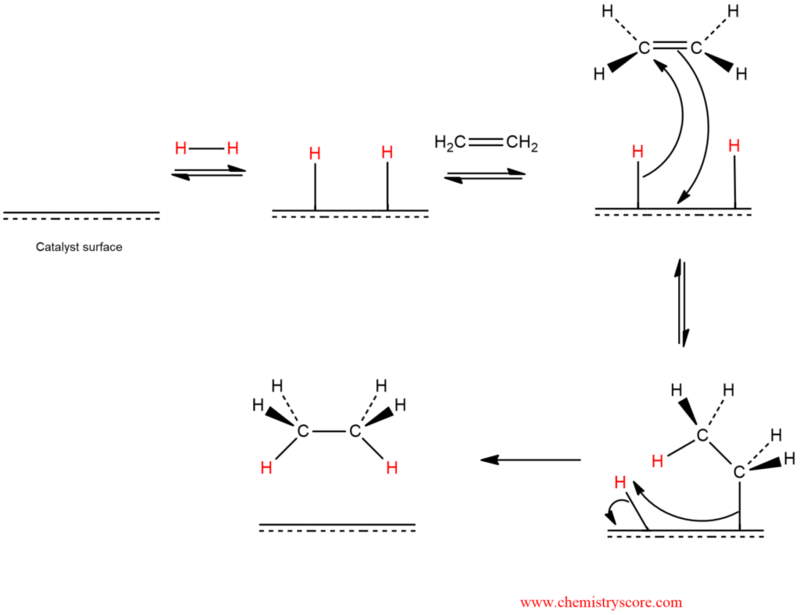 Catalytic hydrogenation involves the addition of molecular hydrogen (H2) across a double bond in the presence of a metal catalyst and the net result of this process is to reduce an alkene to an alkane. Hydrogenation is the simplest reaction of a double bond where its saturation with hydrogen is reached. The process requires a catalyst, which may be either heterogeneous or homogeneous, which means that it is insoluble or soluble in the reaction medium. An important feature of catalytic hydrogenation is stereospecificity. The two hydrogen atoms are added to the same face of the double bond (syn addition). Addition of hydrogen can be from above or from below the molecular plane with equal probability. Heterogeneous catalysis is catalysis in which the catalyst is not dissolved in the reaction medium. The hydrogenation of an alkene to an alkane, though exothermic, does not occur even at elevated temperatures. For example, ethene and hydrogen can be heated in the gas phase to 200°C for prolonged periods without any measurable change. However, as soon as a catalyst is added, hydrogenation proceeds at a steady rate even at room temperature. The major function of the catalyst is the activation of hydrogen to generate metal-bound hydrogen on the catalyst surface. Without metal, thermal cleavage of the strong H-H bond is energetically prohibitive. The catalysts frequently are insoluble materials such as platinum, palladium, and nickel. When steric hindrance inhibits hydrogenation on one face of a double bond, the addition will take place exclusively to the less hindered face. 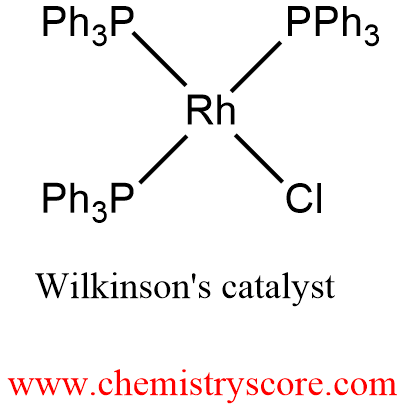 The principle has been used to develop enantioselective or so-called asymmetric hydrogenation. The process employs homogeneous (soluble) catalysts, consisting of a metal, such as rhodium, and an enantiopure chiral phosphine ligand, which binds to the metal. However, the asymmetric arranged bulky groups in the chiral ligand prevent the addition of hydrogen to one of the faces of the double bond, resulting in the formation of only one of the two possible enantiomers of the hydrogenation product.